Transparent Wireless Glass Keyboard facilitates you in getting keyboard experience anywhere. The wireless glass keyboard is enabled via the Bluetooth. To use this awesome Transparent Wireless Glass Keyboard you just need to pair your Bluetooth enabled smart device or tablet with the keyboard and enjoy wonderful typing experience. It can also be paired with the laptop by using the Bluetooth. 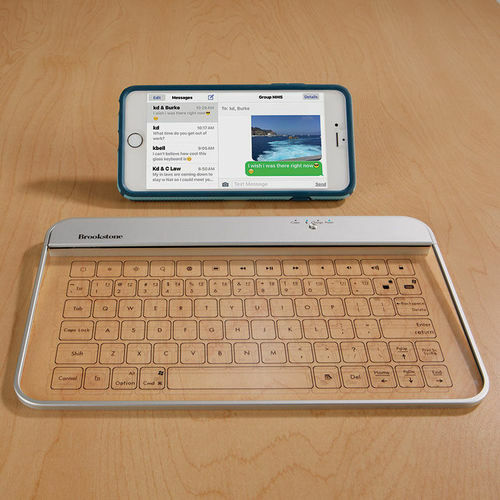 Wireless Glass Keyboard makes it easier for you to type emails and text messages with ease. Transparent Wireless glass keyboard comes with a built in rechargeable battery that you can charge by using a USB cable. It is compatible with iOS, Android®, Windows®, and Mac OS X devices. It also provides you an option to get touch pad mouse function when connected with laptop. Wireless Glass Keyboard has no physical keyboard keys like the traditional keyboard. This keyboard is totally transparent as all the keys are printed on touch sensitive glass surface. It has the same QWERTY layout like your typical keyboard. In short, using Transparent Wireless Glass Keyboard feels like a heaven for all the people who find typing text and emails over the cell phones to be very annoying or in convenient.